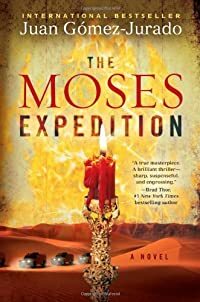 The Moses Expedition by Juan Gomez-Jurado: Synopsis and Online Purchase Options. Synopsis (from the publisher): After fifty years in hiding, the Nazi war criminal known as the Butcher of Spiegelgrund has finally been tracked down by Father Anthony Fowler, a CIA operative and a member of the Vatican's secret service. He wants something from the Butcher — a candle covered in filigree gold that was stolen from a Jewish family many years before. But it isn't the gold Fowler is after. As Fowler holds a flame to the wax, the missing fragment of an ancient map that uncovers the location of the Ten Commandments given to Moses is revealed. Soon Fowler is involved in an expedition to Jordan set up by a reclusive billionaire. But there is a traitor in the group who has ties to terrorist organizations back in the United States, and who is patiently awaiting the moment to strike.